Rosemont Square Apartments offers 1 & 2 bedroom apartments. Please select a unit that you like, fill out your name, number, and email, and you will be redirected to our quick and convenient online application. Not seeing what you're looking for? Availability changes every day, if you tell us what your needs are, we’ll call you when availability changes. All room dimensions are approximate and may vary by apartment. Let Rosemont Square introduce you to your ideal living space. Choose from our one and two bedroom apartments for rent in Randolph, Massachusetts. With eight attractive floor plans available, our apartment homes feature spacious layouts and recent upgrades for living in comfort. Our luxury apartments offer newly designed kitchens with modern stainless-steel appliances and a convenient breakfast bar in select homes. Each of our kitchens also offers ample storage space and a timesaving dishwasher so it’s easy to keep your cooking space clean and organized. When you’ve finished dinner, enjoy a glass of your favorite beverage on your private balcony or patio, and take in the scenic community views. To ensure you can find the right space for you, our apartments offer a variety of unique upgrades at Rosemont Square Apartments. Select apartment homes feature a convenient in-home washer and dryer so you won’t even need to visit our 24-hour on-site laundry facilities. Some floor plans offer a garden soaking tub where you can let yourself relax after a long workday or a hard workout. 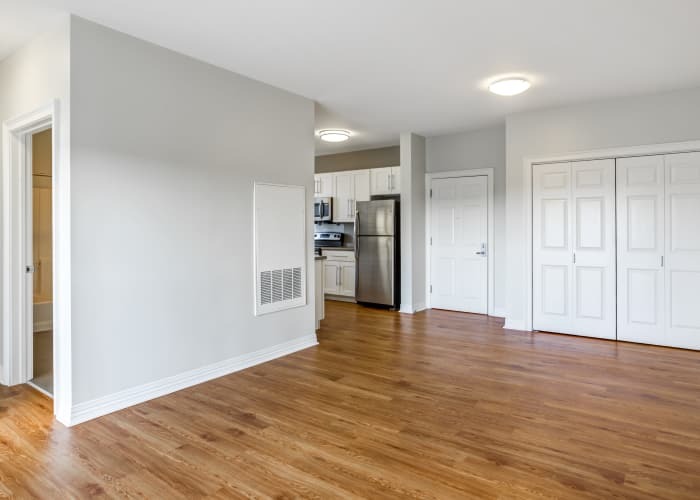 Some of our Randolph, MA, apartments for rent boast handsome and easy-to-clean hardwood-style flooring for a touch of modern design. Five Floor Plans Ranging From 735 sq. ft. –1,105 sq. ft. Embrace a life of luxury. Reserve your apartment for rent in north Randolph, MA, today.